Huss, Mathias; David Wolfe [artist]; Eli Kahn [printer]. La grāt danse macabre des hōmes [“Dance of Death at a print shop”]. Portland, ME: Wolfe Editions, 1499; . Limited Edition. Limited edition print, in fine condition. 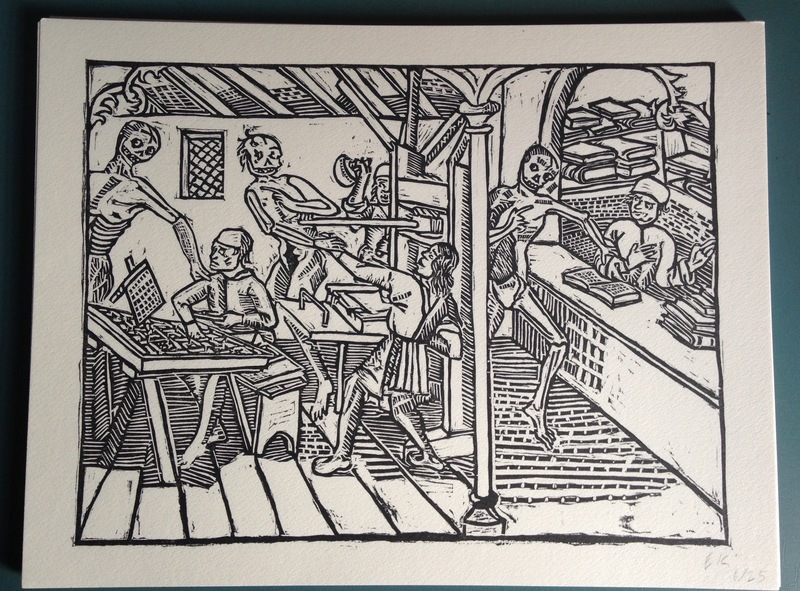 Original woodcut rendition of 1499 plate in late Medieval early printed book, which not only has spectacular representations of death but also the first illustration of a printing office and a working printing press. Run of 25, signed and numbered by printer, approximately 11×17″ Fine. One of the first representations of publishing’s workflow is the wood engraving published in an edition of the “Grande Danse Macabre”, by Mathias Huss (Lyon, 1499); a book representing all trades of the time, in a “Dance of Death” genre, late-medieval allegory on the universality of death. The wood cut depicts a printing press with a compositor, two printers and a bookseller – from production to distribution – separated by a pillar, a common way at that time to make a time or space ellipsis (later used in comic books). Woodcut designed and created by David Wolfe and printed by Eli Kahn at Wolfe Editions, Portland, Maine. I commissioned this work because I loved the image and it is the earliest known image of a printing and bookbinding office. You can find the print for purchase here: Dance of Death at Of Oak and Ash.